Employees form the very crux of any organization, company. The company, organization, depends on employees heavily and the work ethic cannot simply be compromised. It often happens that some employees get unruly or rather under-productive. One bug in the machine can cause the entire thing to collapse. Employees need to be kept under control, and they have to follow a rule of conduct and strict discipline. Warning Letters are an ideal solution in these cases. It is primarily divided into two parts. The first part deals with all detail regarding the employee and the second deals with the rules/code of conduct violated by the employee. This primarily deals with the behavior of the employee. The first portion consists of employee details and the rest the violations in behavior and suggested corrective measures to be taken. It is short and precise. 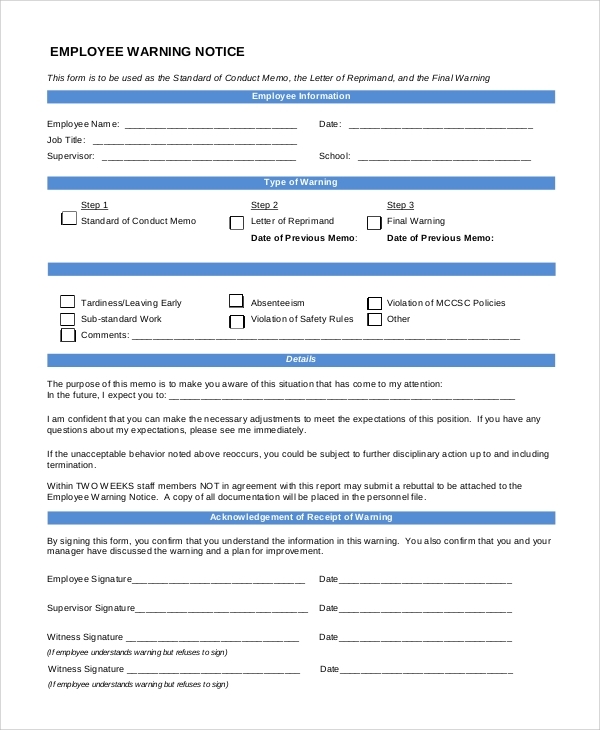 It highlights all disciplinary actions to be taken, a short detailed summary of the employee, and finally a list of all violated rules and code. 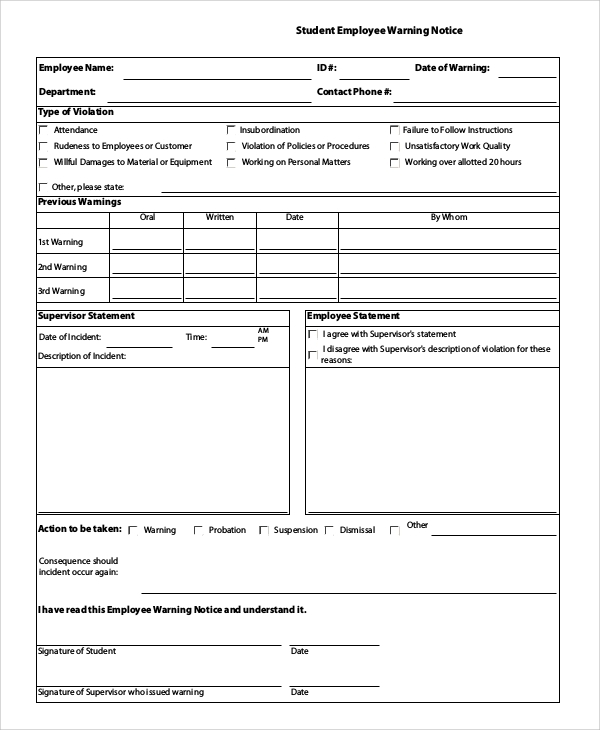 A Final Notice Samples usually acknowledges the fact that the manager has addressed the employee about the unsatisfactory performance regarding work or his behavior, but the problem persists. In such scenarios, the only option is an employee warning notice. A verbal warning might be taken for granted by an employee. It also might be so that the employee is ignorant of his/her inefficiency. The employee notice can be a handwritten letter sent to the employee in person, or it can be an email sent via the manager. It’s a precursor to chucking out an employee who fails repeatedly. 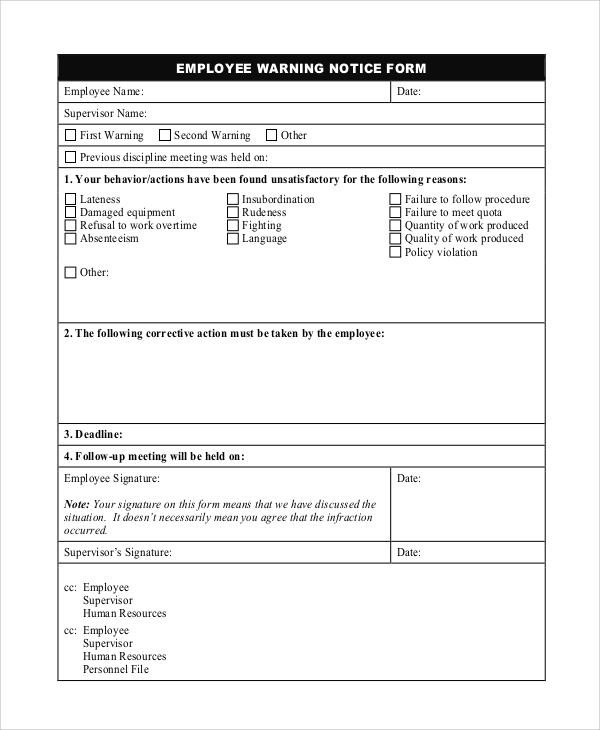 This is a bit more detailed warning notice and contains employee information, a letter addressing of the employee and pointing out his/her errors, the nature of the infraction and all subsequent details. You can also see the Best Written Warning Samples. This is a bit formal in nature. 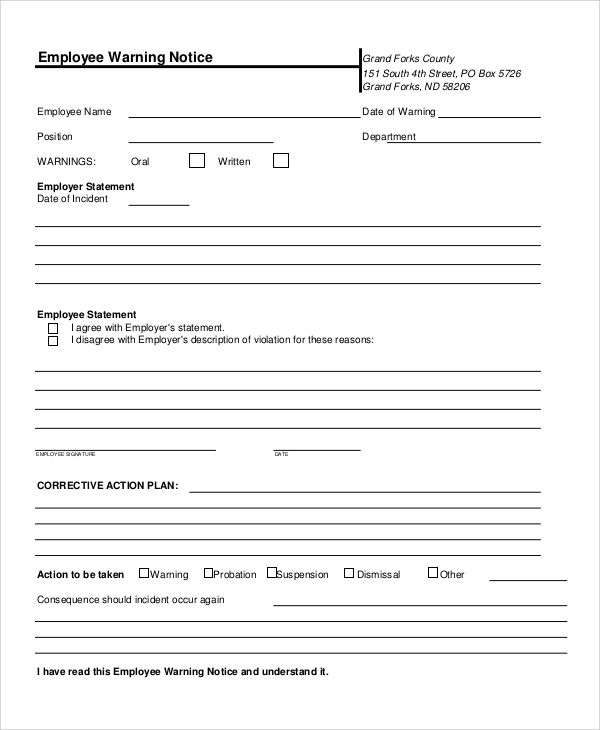 It consists of employee details, type of violation, records of previous warnings, supervisor statements. , employee statement and the action to be taken. Employee warnings act like a last chance given to the employee to get rid of his/her shortcomings in the workplace. After which he/she will be subjected to disciplinary action, maybe a cut in pay or any such strict measure. 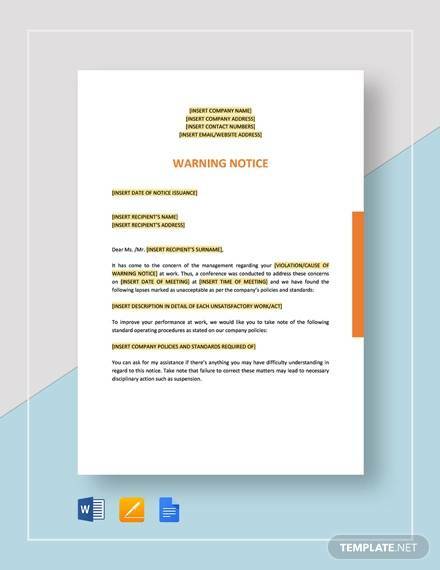 That is why professionals in the field always tend to write employee warning notices for improvement in employee’s behaviour or work performance. You can also see the 30 Day Notice to Landlord Samples. A warning notice might work wonders for an employee as warnings usually tend to work in the workplace. 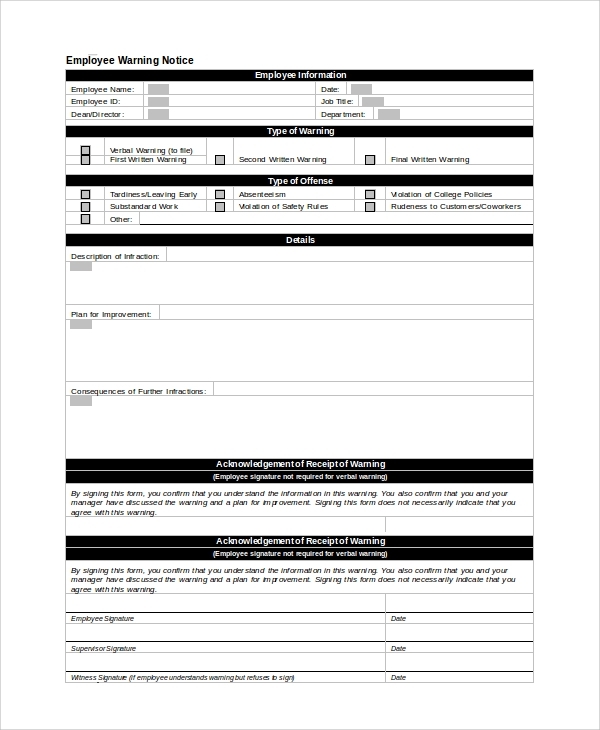 The premade templates ensure you don’t have to sit through a letter directed at employees and save time and effort. You can always choose from our range of premade templates and Sample 2 Week Notice Letters and edit as well as modify them to suit your cause. Save your time and effort by choosing from these premade templates, all proof read to ensure accuracy. You can also check out other websites.